The impact of climate change is already being felt on ecosystems, economic sectors and people's health and well-being in Europe. All regions are affected, but not in the same way. 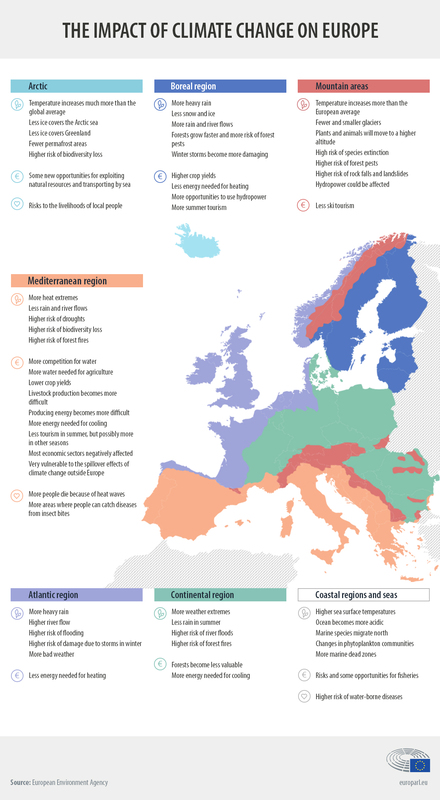 The effects have been mostly negative, although in some cases there were also some benefits, such as a lower demand for heating and better conditions for agriculture in northern Europe. Check out our map to find out how your region could be affected. The map shows how climate change could affect the different regions in Europe. The data comes from a report by the European Environment Agency. To find out more about the causes of climate change in Europe, check out our infographic on the EU's greenhouse gas emissions by country and sector.